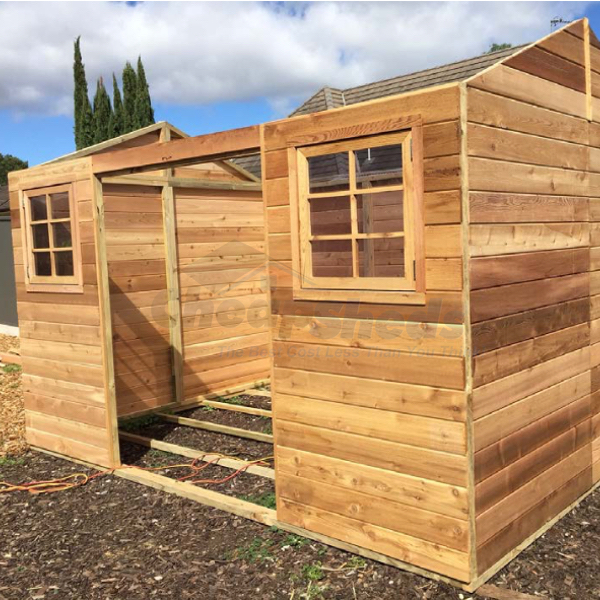 Customer Dhananjay from South Australia is a proud owner of a Stilla Willow Timber Shed. She bought it in 2016 and had it assembled at home. She sent us some photos and feedback about her experience which we decided to share with you in this article. We have also outlined the assembly process as per the manual with some visual aids and photos for anyone looking to buy one themselves. 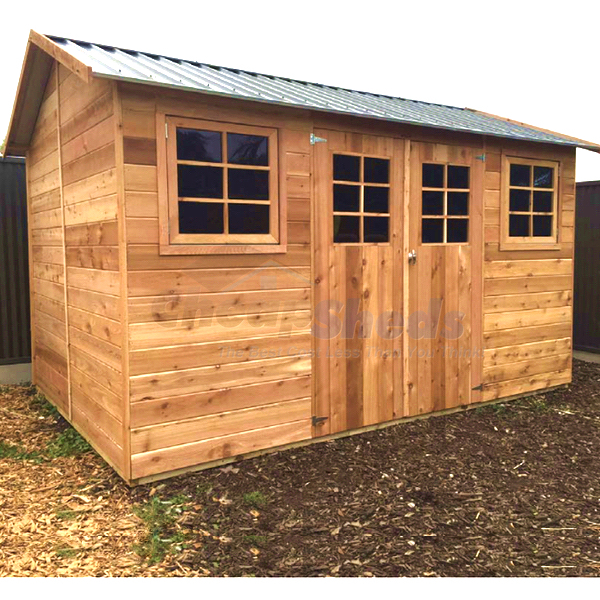 Here is her beautiful Timber shed in all its glory. 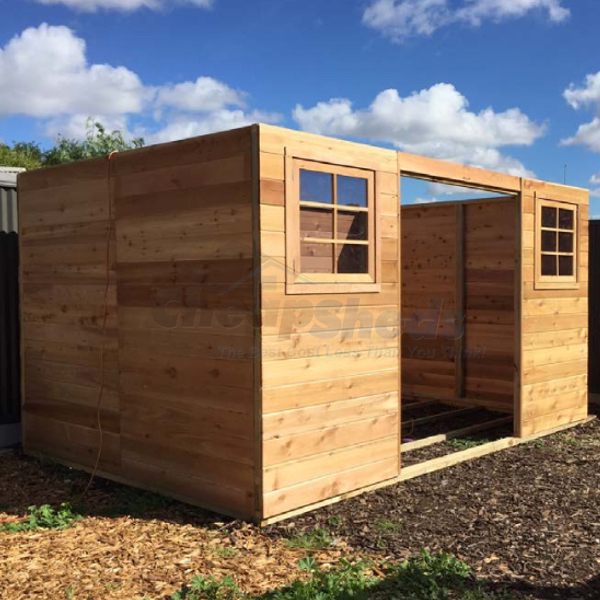 Excellent product – Stilla sheds are highly recommended. I will pick these any day over the ‘tin sheds’. This product looks good in photos and looks even better once put together. Easy to assemble and comes with a comprehensive set of instructions. 10 Year warranty! Overall very happy & satisfied with all aspects of the purchase. 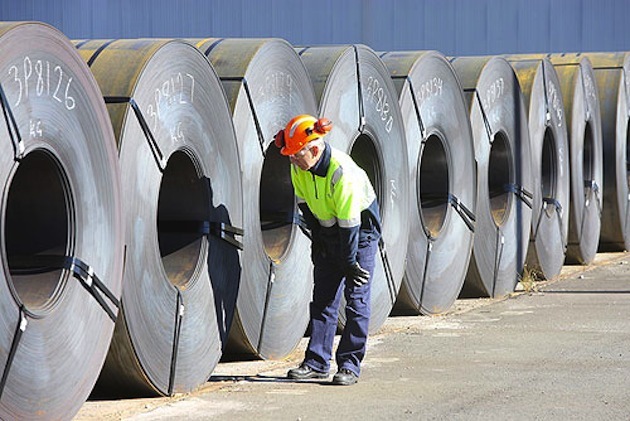 And yes – glad I didn’t go with the overseas made tin boxes that are totally unsuitable for the Australian climate. Tin sheds become a furnace in summer and attract spiders and bugs all year around. 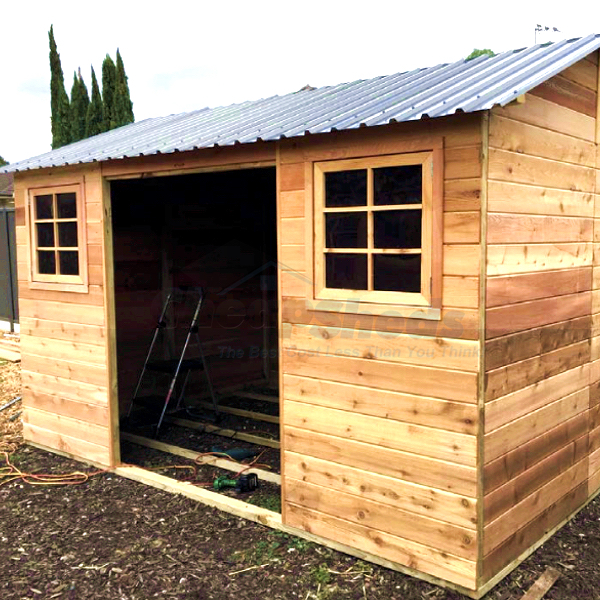 Compared to the aesthetic look of the ‘western red cedar’ metal sheds look very ordinary in appearance and are prone to rust and corrosion. 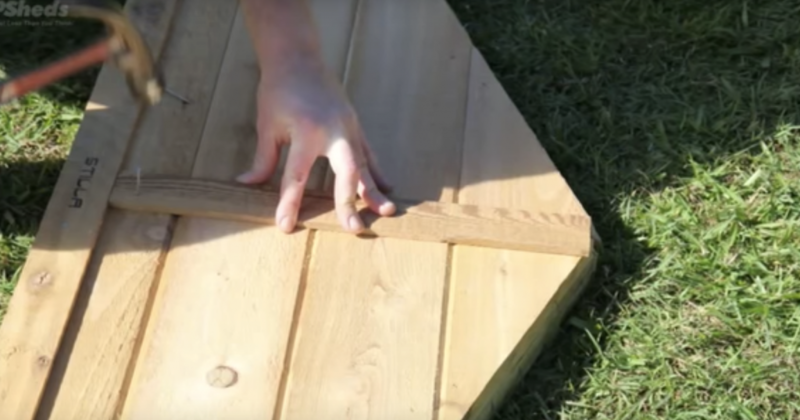 Before you start building a shed, you need to prepare the site. Clear the area of stones and remove all plants, roots and other obstacles. Then use a rake or shovel to level the surface if need be. First, unpack the shed kit before starting to make sure you have everything you need. Become familiar with the parts and labels. It is recommended to use a clean work surface to spread the parts out. Remove all parts from packages and place in a safe close to the assembly area. 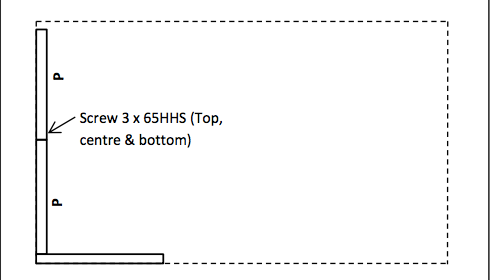 IMPORTANT: The parts mentioned below will be outlined in your manual- so please refer to it for the labels. 1.First screw through wall panel P, into window wall panel FWP (top, centre & bottom) using 3 x 65mm Hex head screw. (Holding studs flush on the inside). It’s important to check the Labels as each panel will fit differently into the design.Check out the diagram below. 2. 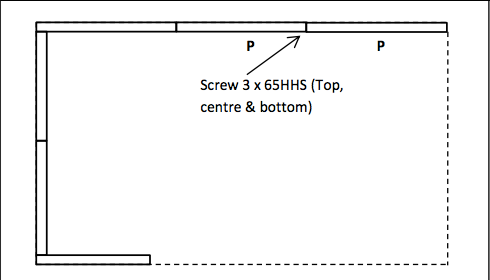 Then you can screw through wall panel P into the adjoining wall panel P (Top, centre & bottom) using 3 x 65mm Hex head screws (holding studs flush on the inside) see Image above & diagram below. 3. 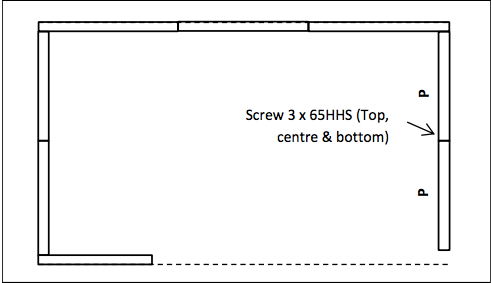 You continue the same process from by screwing through the next wall panel P and another wall panel P (Top, centre & bottom) using 3 x 65mm Hex head screws, holding studs flush on the inside. 4. Surprise surprise the next step is identical to the one before. 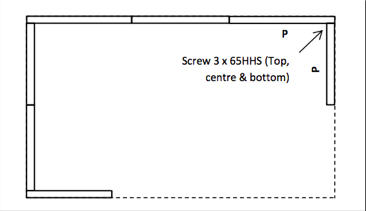 Please screw through wall panel P into wall panel P (top, centre & bottom) using 3 x 65mm Hex head screws. 5. Now onto the next corner of the shed. You do the same by screwing both wall panels labelled P (top, centre & bottom). 7. The final corner, you need to screw through wall panel P into the window wall panel FWP (top, centre & bottom) using 3 x 65mm Hex head screws. Lay 2 x Gable ends to face down on a flat surface. Screw together in the position shown, holding flush at the bottom (using 2 x 65mm Hex head screws). Repeat with the other gable pair. Position gable cover strips (BGS) gable cover strip over join in the gable. Fasten in position using 40mm nails. 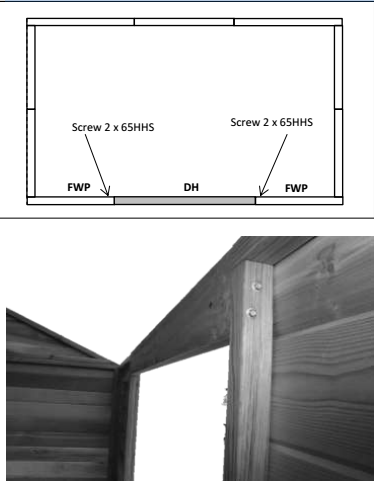 Gable Cover Strip (BGS) must be flush with the bottom of cedar cladding. And repeat for the other gable. Now carefully lift and position gable ensuring the tongue on the wall goes into the groove on the gable. 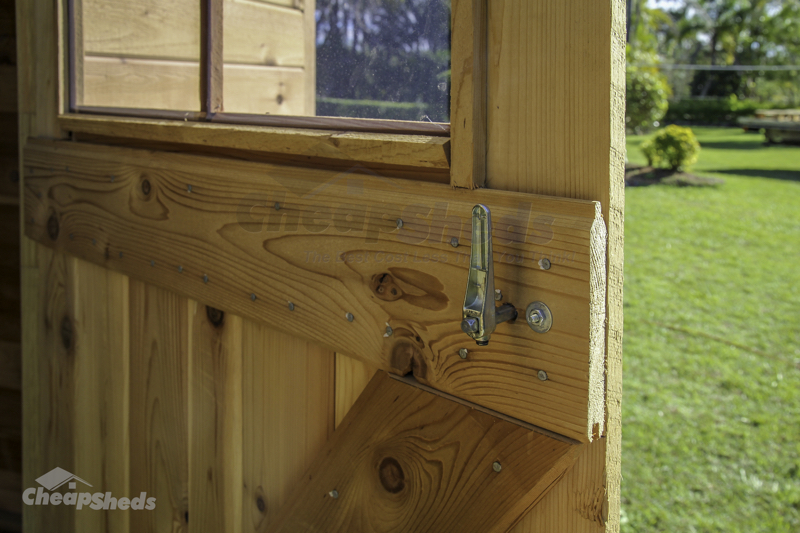 Fasten up through panels using 1 x 65mm Hex head screws either side and 1 in the centre. Repeat with the other gable. Measure down from Gable peak 145mm and mark with pen/pencil. Hold ridge beam bracket below mark (top of bracket flush with mark) and screw through the bracket into gable using 2 x 50mm Phillips head screws. Repeat this step on both gables. 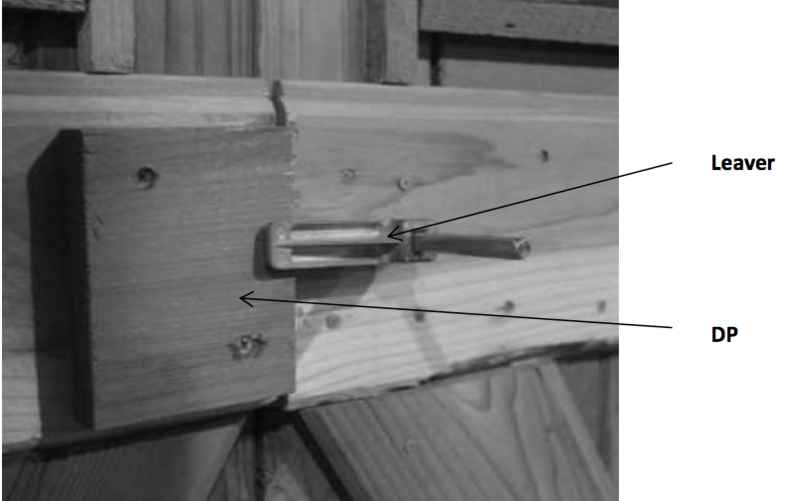 Place ridge beam on top of ridge beam brackets, ensure beam is hard up against gable. 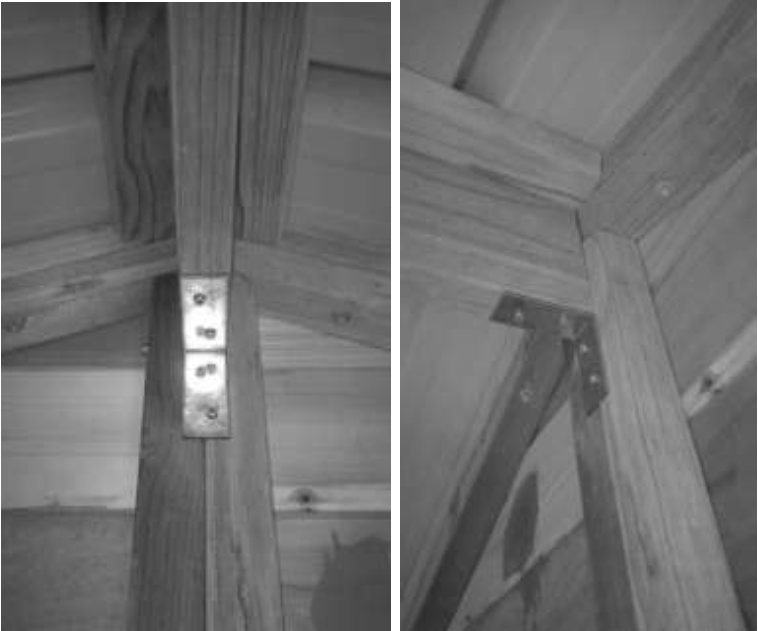 Screw up through ridge beam bracket into ridge beam using 2 x 50mm Phillips head screw each end. 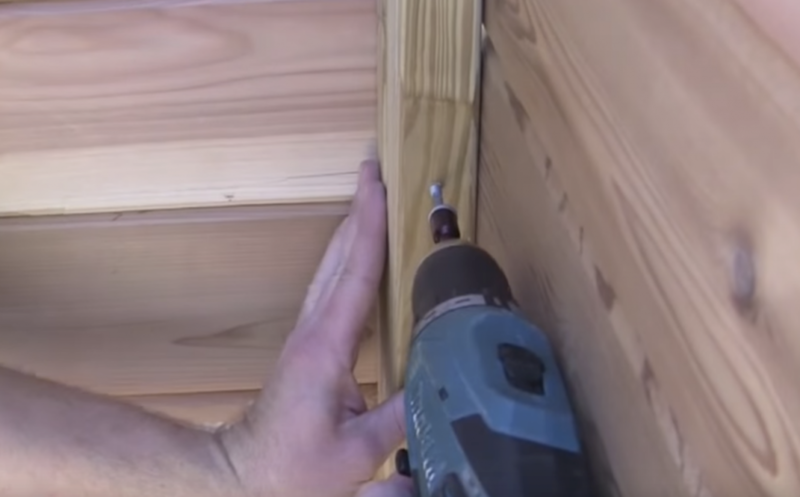 Push the Rafter into Bottom Batten and the Top Batten and insert 100mm batten screw (100BS) into the pre-drilled hole to fasten. 1 x 100BS per join. 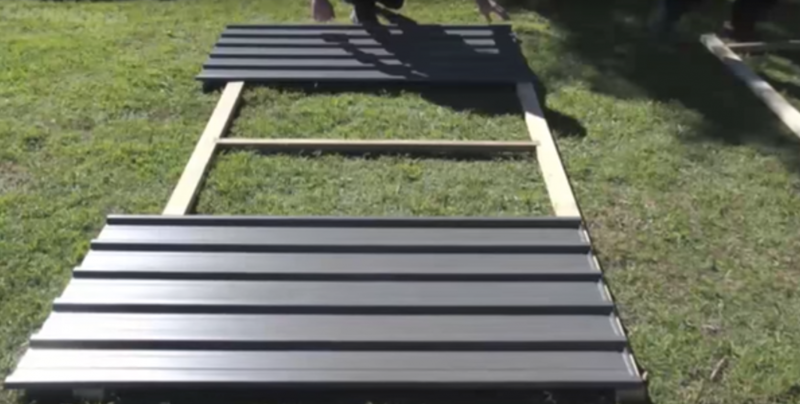 Lay roof frame on a hard surface. 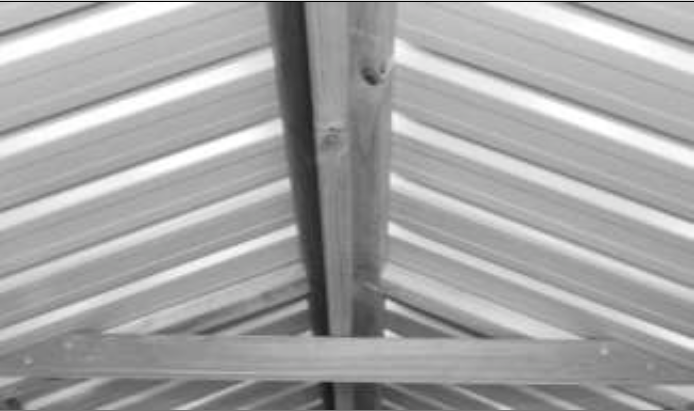 Position 1 roof sheet (RS) at each end, flush at the top and flush with the end of roof battens. 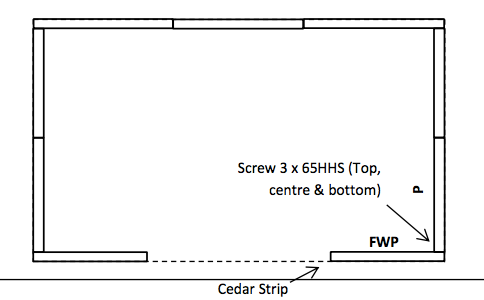 Fasten roof sheets to roof frame in number sequence shown in the diagram using 25mm roof screws (25RS) into the Top Batten and 40mm roof screws (40RS) in the Bottom Batten. Note: only screw in Pan at the top and in rib at the bottom. Complete laying roof sheeting out on the frame. 1 x 25mm roof screws in the pan beside every rib. Once top complete screw bottom off using 1 x 40mm Roof Screws through every rib. 1 x 40mm roof screws through every rib. 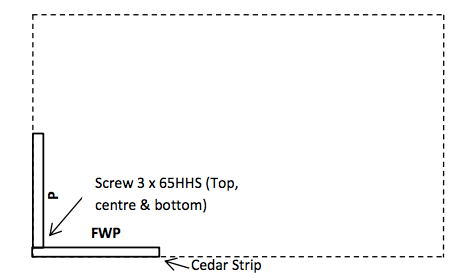 Note: Use a straight edge to keep all screws in line and centre of the batten. 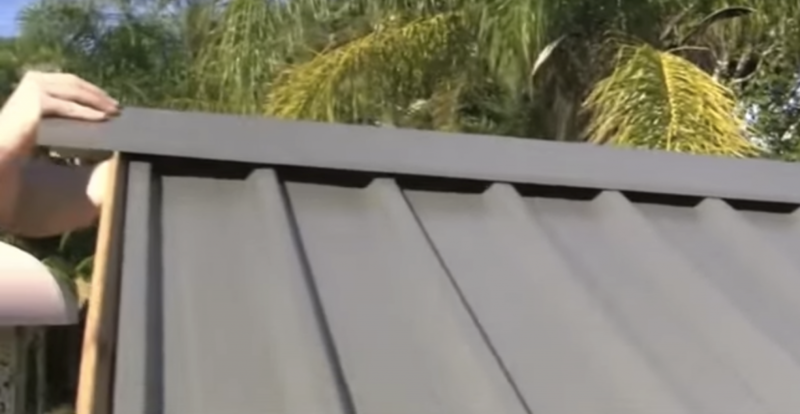 Slide 3905mm channel onto the end of roof sheeting overhang. Fasten in place using 12 mm self tapping screws (ST). 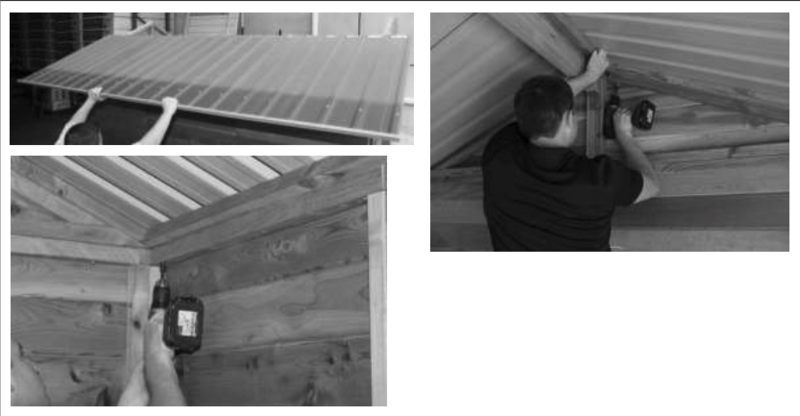 REPEAT TASKS 3.4 – 3.8 TO COMPLETE THE OTHER ROOF PANEL. 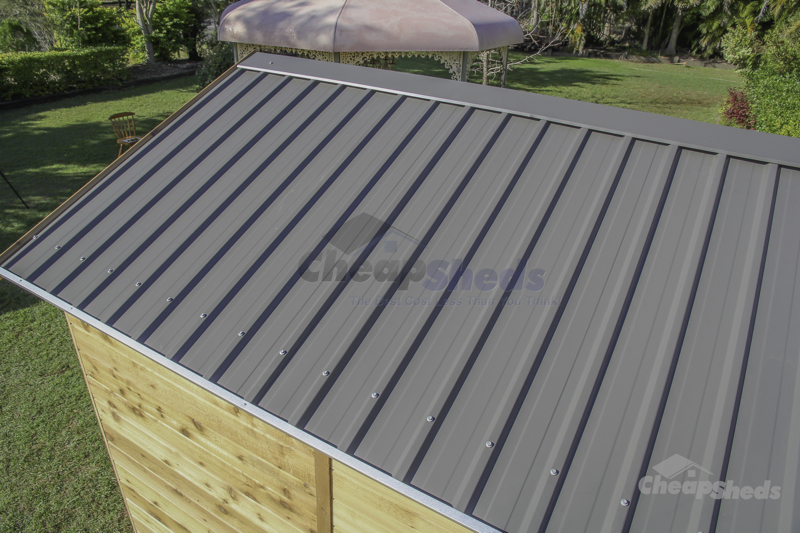 Slide roof panel into position and fasten up through front and back gables. 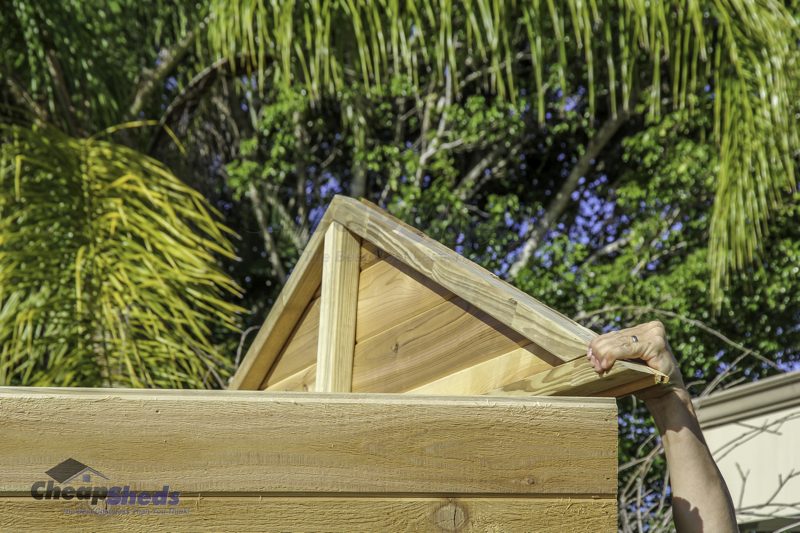 Ensure roof rafters are flush with gables. Fasten up through side wall top plates at each end and each panel join. 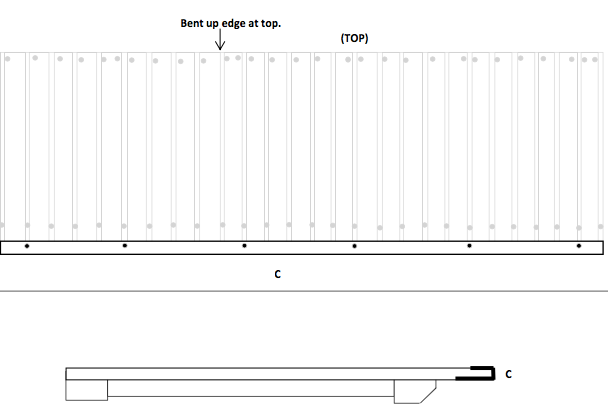 Ensure walls run parallel with bottom batten (BB) on the roof. 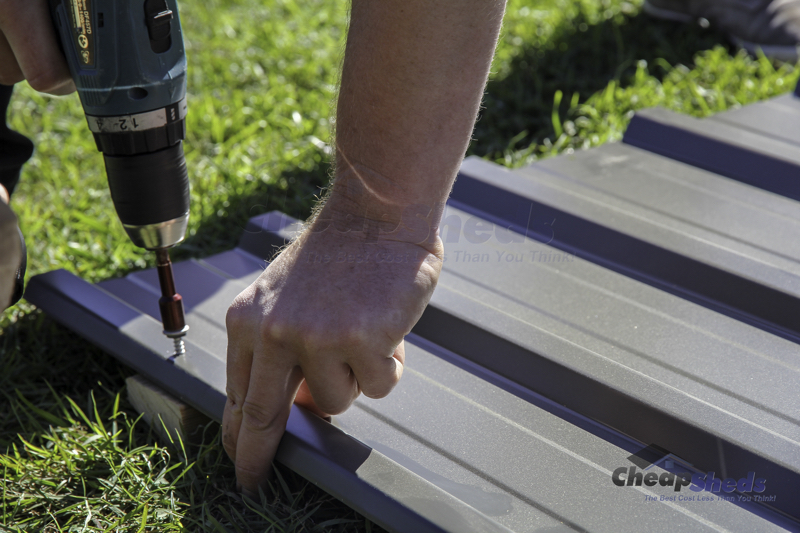 (Repeat this step for both roof panels) This task will require 2 or more persons to complete. Holding Collar tie tight and level in position screw through Collar Tie into the Roof Rafters. Place door back on and hold hinge (H) in position. 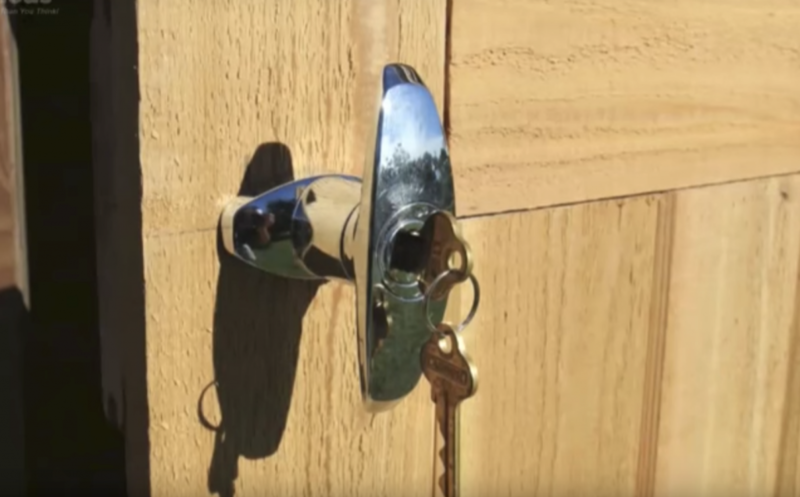 Fasten hinges to the door using 3 x hinge screws (HS) per hinge. Repeat Step with the second door. Hold door in position, 3mm down from top the Front of the door when closed will be flush with the front of VJ cladding. Screw through hinge into the front wall (as pictured). Repeat steps with the other door. Note: door centre gaps can be adjusted by unscrewing wall to floor fixing and moving in and out. Hold Pad Bolt in position and fasten to the door. Mark centre of bolt and drill 12mm hole in marked position. 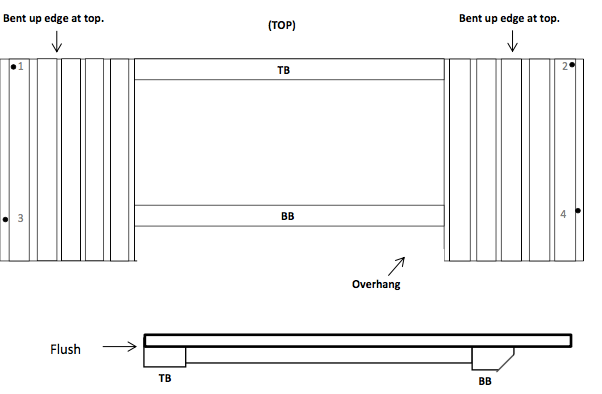 Repeat for bottom pad bolt. 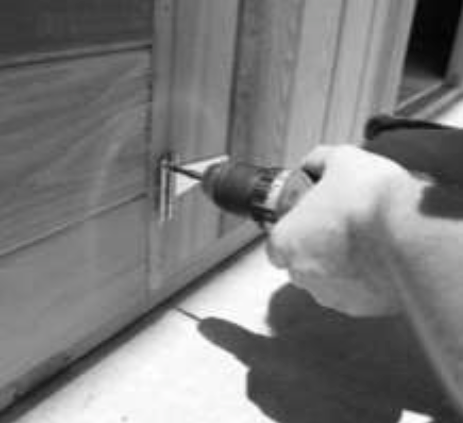 Mark and drill 12mm centre hole in the position shown, 50mm in from door edge. T Handle must be installed centre of the centre door brace (on the back). 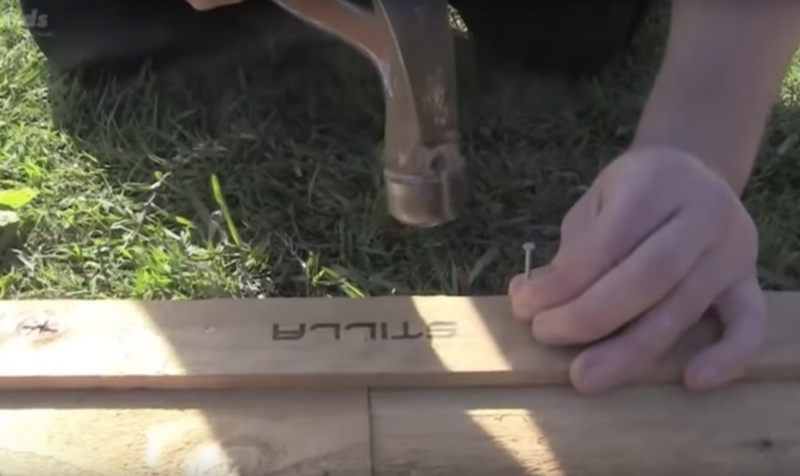 Insert T-handle in position and mark two outside holes. Remove T-handle and drill 2 x 6mm holes. Insert T-handle back in with bolts, and fasten nuts on the back of door. Holding door in closed position, flush with the other door – slide leaver onto T-Handle and tighten once hitting packer on fixed door. Hold corner post (CP) in position. 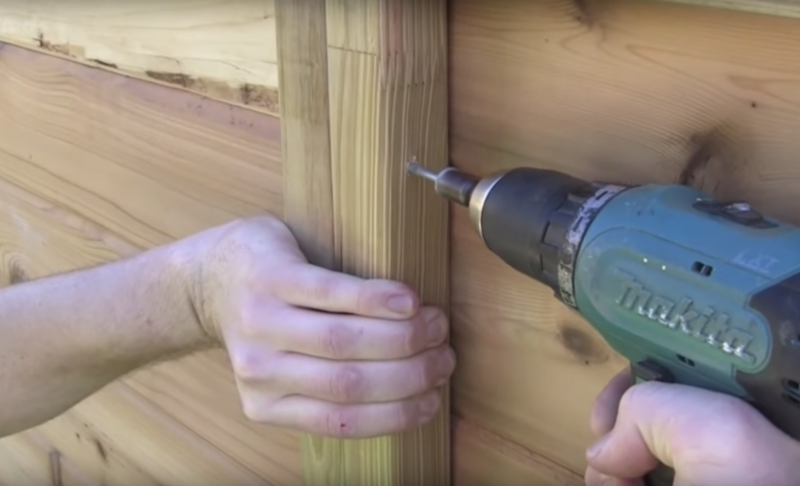 Fasten through corner post into wall stud using 6 x 50mm nail, spacing evenly up each corner post. 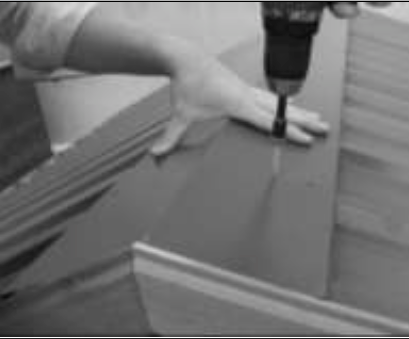 Hold fascia’s in position- Flush with the bottom of battens and joining evenly at the top. Using 50mm Nail fix it to the frame. Slide ridge cap into position. Make sure peak of ridge cap is in line with the peak of fascia’s. Screw through ridge cap into 2nd rib in from the end and through into roof batten. Slide second ridge cap into position and fasten at opposite end. Ensure ridge cap is straight, fasten through the centre overlap. Nail one floor board (FB) in position at front of shed. Nail through floorboard using 2 x 50mm nail per joist. Lay rest of boards in position. Cut the final board to suit gap. Once all boards are in position, nail through each board into each floor joist using 2 x 50mm nail per joist. 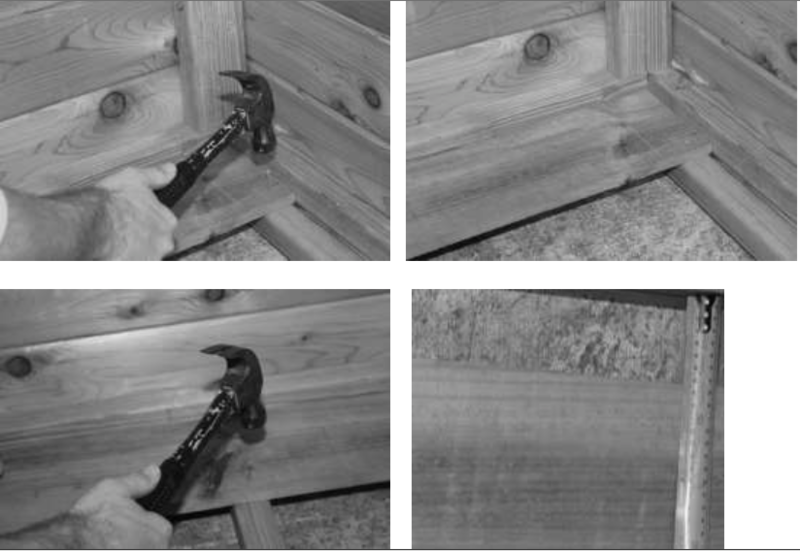 Note: Use a straight edge to keep nails in line and centre of the joist. 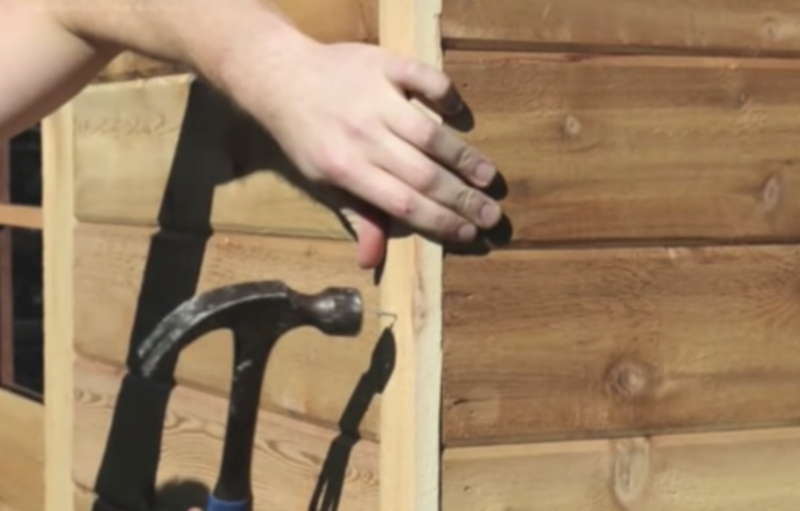 The final and most important step of your assembly are securing your shed to the based and ground. 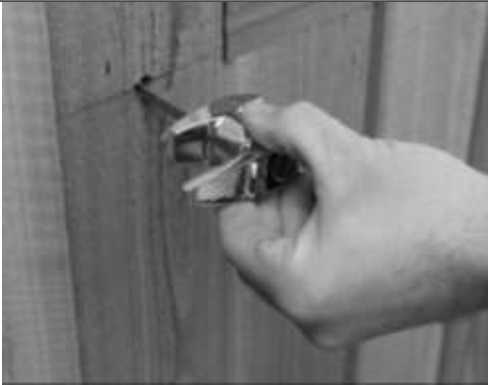 If you do not safely secure it you risk damage to your shed, your home or yourself during bad weather. How you secure it will depend on what base you have chosen and if you will anchor it to the ground or concrete. 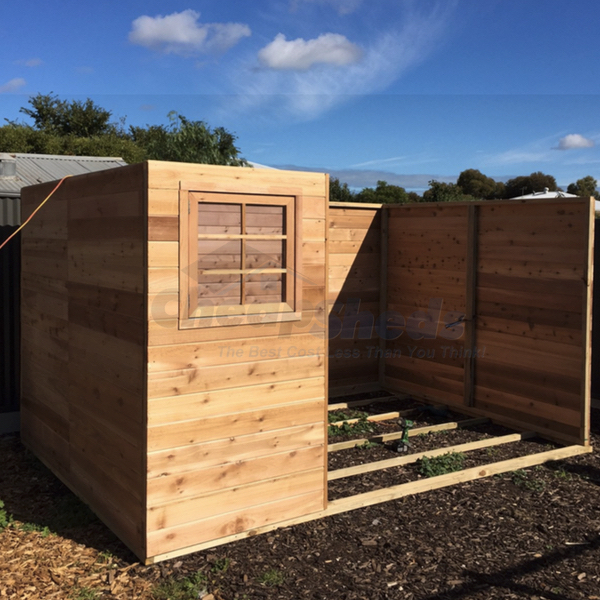 Looking for a Mountain Blue Garden Shed?